How to become a Professional Knitter - Robin Hunter Designs: Do You Own a Digital Scale? I just had a discussion about whether a pattern should use a measurement or a yarn left weight when giving instructions. I've always gone with a measurement assuming that not everyone owns a scale. I'm being told however that it has become a standard part of a knitter's supplies. I'm thinking I may start putting both pieces of information in my patterns. Mine isn't the brand in the photo above but it looks very similar. What about you, do you own a scale? 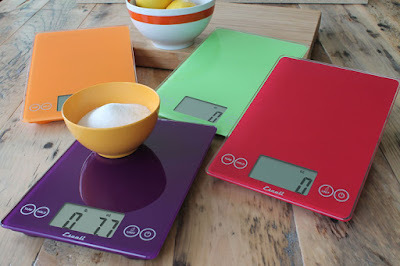 Labels: # knitting blogs, Do You Own a Digital Scale? I do happen to own a scale but only because a while back I was making soap. I use it for knitting to weigh my finished items and record how much yarn I actually used. Helps if I ever want to make the pattern again or if I am insane enough to ever try to spin the yarn. Personally I still think the measurement/yardage is better information but giving both weight and measurement certainly can't hurt. I have a scale, and it is an important element of my design tools! I do usually give information in measurements/length, but I figure those by weighing and mathing it out. Which do you actually prefer? I own a scale but I also put in yardage because some people don't own a scale....then again, how does one calculate yardage without a scale without wrapping it around some sort of measurement tool (like a niddy-noddy)? Yes, and I find it essential for sideways shawls where you increase until halfway through your yarn, so I know when to start decreasing. Also some patterns tell you to use percentages for planning, I.e. 30% for increase section, 30% for decrease, and 40% for border. The scale is by far the easiest way to check progress.